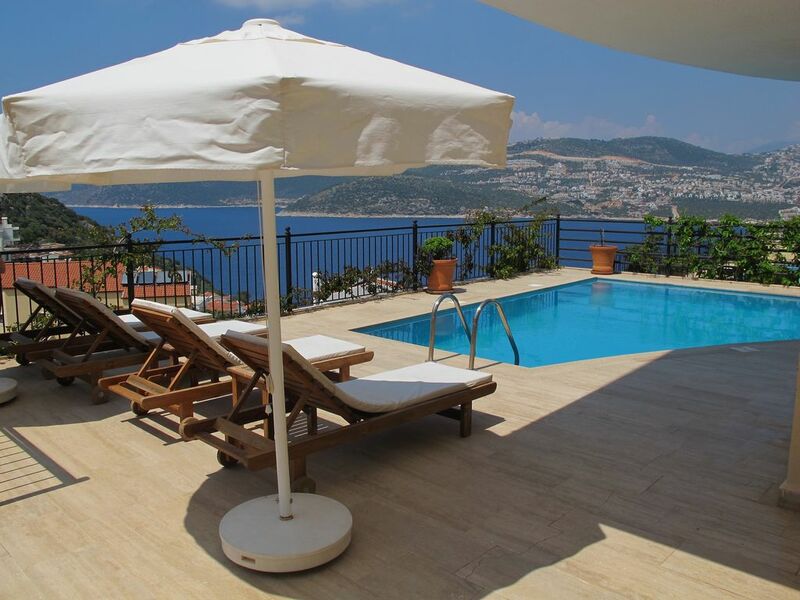 Villa set over 3 floors in the exclusive Kisla area of Kalkan. A short walk to the beach club offering a boat taxi directly into Kalkan harbour (5 minute trip). The Villa has panoramic views from the roof terrace, the balcony and from the private pool. The property benefits from being full air conditioning throughout and its own private garage. The ground floor comprises a large open plan kitchen / living area and the kitchen is fully equipped with all the latest mod cons. The living area features comfortable seating area with satellite TV including Sport and Movie channels, DVD and music centre and fantastic views of Kalkan Bay. Barbecues are available by the pool and on the roof terrace. A Jacuzzi has been added to the roof terrace with views of the bay. WIFI is available throughout the property (access details provided on arrival). One bathroom is found adjacent to the living room with both double bedrooms having en-suite facilities. A further bathroom is located on the top floor. Satellite TV including Sport and Movie channels, DVD player, music centre. 2nd living room which is found on the top floor has a sofa bed and TV. Cooker, hob, oven, fridge freezer, washing machine, dishwasher, microwave, toaster, sandwich toasting machine, coffee percolator, and all kitchen utensils. Outside: Barbecues are found by the pool and the roof terrace. The roof terrace features wrought iron furniture. The pool area also has sun loungers and a table and chairs for al fresco dining. Utility Room: Ironing board and iron, vacuum cleaner. Cleaning / Towels / Linen / Maid service: Clean towels (including beach towels) and linen are provided. These are changed weekly. Other: Private garage. The view over Kalkan Bay is spectacular. The website offers a slightly misleading description - the 2 bedrooms on the uppermost floor is a box room with 2 twin beds and the lounge through which you access the wetroom with a single Z bed. Couldn’t sleep 8. Antalya airport is not 2 hours away its 241km and takes over 3.75 hours on a good day. It is not brand new as stated as the villa is looking tired, in need of modernisation and TLC (internal fittings are corroded, sun bed mattresses are stained and worn etc). There are no instructions on how to use the equipment provided and as we didn't see the manager until we emailed about a problem, there was no way of knowing how to use them. Washing machine wouldn't fully work (wash no spin), the microwave is broken and only 2 plates on the stove work. The TV is old and to play a DVD you have to unplug the skart and plug in the DVD connection. There are no instructions on how to receive satellite (just a CNN channel the others not being part of the package) and it took us 2 days to work out how to view the news. Anyone slightly non techie would have struggled. TV is old model not geared for the modern wide screen relays so you loose the sides – a bit of a problem when it’s a studio and the presenter disappears! The bedroom TV’s do work once you figure how to start them but only show local TV. We found that many of the lights around the house need new bulbs, the remotes needed new batteries (£12 worth had to be bought in the town) and you have to be aware that the multi-plug cords snake everywhere. The pool was well maintained. The site should warn people of the steep roads to traverse. Going down, OK back up strenuous. What a beautiful apartment. Very well looked after and with plenty of amenities. The view was amazing, by day and by night. Chilling by the pool looking over the bay was amazing. The owners local agent Hamza was a very happy and helpful person. Nothing was too much for him. We spent the week and enjoyed every minute. I would suggest if you have children that you consider car hire as it is only a few minutes from the beach clubs, but it is in a valley and quite a steep walk back. EXCELLENT apartment. The owner was very helpful when contacting with questions. I would defiantly go back and it was worth the money I paid for the week. Very good value for money. The beach club is 3 minutes walk from the villa. The beautiful Patara beach is only 15 minutes away by car / taxi. Kalkan beach is a 25 minute walk or 5 minute boat taxi away. Dalaman airport is 90 minutes away. Antalya airport is 2 hours away. Transfers from the airport can be arranged. Changeover Day: Changeover days are flexible dependent on availability. Notes on prices: Prices are for the property per week in UK pounds. We can accommodate long lets, please call for further information.